The season of Lent has come to a close. We are in the midst of the three holiest of days in our faith. As we anticipate and prepare to celebrate the joy of our Savior’s resurrection we may be tempted to leave behind the call to take up our crosses and follow Him. As we witness the conflicts and strife in our world let’s follow, even more closely, our Lord in the Way of the Cross, the Way of Forgivness in His redemptive love, the way of the resurrected One. Heavenly Father, like the Jews we want proof to satisfy our finite senses. Like the Gentiles we want knowledge to gratify our intellectual pride. As we come to your Son help us realize that we cannot contain or comprehend the love, the mercy, the life you call us to share. Forgive and free us to follow you our God and Savior. Jesus, Lord, you take your cross showing us the path and way of repentance. Lord as we, with you, take our cross help us let go of our sins, of anything that hinders us from knowing and loving you. It is in your Presence, at your holy cross, we find the fullness of life you created us to know. It is there we find the path to you and your Kingdom of truth and love. Holy Spirit, open our eyes to recognize the reality and sorrow of evil that caused you to stumble and fall. Forgive us for pretending or for trying to excuse the lies of sin and deception our enemy offers. Spirit of God lead us to the power of your peace, and the fullness of your mercy. Heal the brokeness of our hearts by your Presence. Restore those crushed in spirit by the embrace of love. Blessed Mother as you saw your son, struggling with his cross, as you came to him in your sorrow your broken heart was filled with His Spirit. That same Spirit longs to fill and flow through our hearts and lives as we embrace the freedom of the cross. Holy Spirit fill our lives with your truth and love, empty us of all that is false and selfish. Jesus, like Simon we sometimes face the cross thrust into our lives. You let us choose to follow you and take our cross, or to deny you and that which you would offer. Lord, may our glory, our pride be found only in you. May we share the truth of your peace and the power of your mercy in the journey of our lives . Heavenly Father, we pray with King David for your mercy. Cleanse us of anything that would cause my sister or brother, or me, to stumble or fall. May the nail-scarred hands of your Son wash away the grime of this world and the lies of the deceiver that have stained our souls. Lord we thank you for the freedom of your forgiveness. May we live that freedom for you and your Kingdom. King of Kings, struggling up Golgothas hill you met the women of Jerusalem. Days before they had come to meet you with praise and palms. Their joy had been robbed as they yielded to the doubts and fears of the masses. 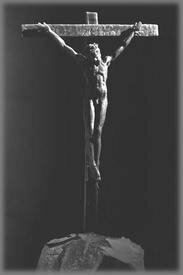 Lord of the cross, forgive us for allowing our faith to falter, for trusting our fears more than your love. Jesus free us, to simply love and trust you and your word. Behold thou desirest truth in the inward being; therefore teach me wisdom in my secret heart. Purge me with hyssop, and I shall be clean; wash me, and I shall be whiter than snow. Lord we get so cluttered. We carry such silly burdens of the stuff of life. All the worries and grudges, resentments and fears we cling to make us stumble and bring sorrow to you. Lord the false light of our pride of achievement or abilities simply blinds us from seeing you and ourselves. Jesus we are sorry. Forgive us. Help us to learn that you set us free from the burdens of this world to take our cross with you. You open our eyes to see the gift of who we truly are, created for and restored in your love. For I decided to know nothing among you except Jesus Christ and him crucified…my speech and my message were not plausible words of wisdom, but in demonstration of the Spirit and power, that your faith might not rest in the wisdom of men but in the power of God. Jesus, what did you think as they stripped your clothes from your beaten and bleeding body? Fear? Embarrassment? Shame? Yet, in your holiness and love you must have felt …sorrow. Lord in stripping off our pride and excuses, in simple repentance, we are afraid, embarrassed, ashamed. But Lord in your Presence we find we can be clothed in mercy, filled with forgiveness and sharing in the beauty and joy of your holiness. Jesus may the truth of your love calls us to you and to your cross. Savior, as the nails pierced your body you heard the cries of the fallen being crucified with you. You heard the cries of all of us, who have failed and sinned. In your pain and anguish you carried the pain and anguish of all those pierced by sin. You brought to all who call out to you, in simple repentance, the promise of the Paradise of your Kingdom, the truth of your forgiveness and love. Holy Savior, mercy-filled God, in the shelter of your cross we find peace. Jesus in the Presence of your broken Body we find your holy love that fills us with… You. Savior, for all the times we trust in self, the emptiness of the world, or our fears and failures, forgive us. Jesus you are our God in whom we trust. Heavenly Father, as they took the Body of your Son from the cross you saw the sorrow and fear of his disciples. For the only time of eternity you felt the emptiness of your Son separated from you, by our sins. And, Father God, you saw our fears and sorrows. You saw the emptiness of our lives apart from you and apart from each other. And you saw the holy blood shed for our forgiveness and healing. You saw your Son, Jesus, our hope, as we turn to you in prayer. Holy God, at the tomb it is so quiet. Yet in the silence we can hear the hope and promise of your resurrection, the promised fullness of your Holy Spirit.